Gastric bypass and gastric banding surgery are some options for morbid obesity. Obesity is a serious problem with today's society and many are curious what gastric bypass and gastric banding surgery is all about. Before one considers gastric bypass or gastric banding one needs to understand the ramifications of obesity and more importantly morbid obesity on one's health. Obesity increases ones risk for high blood pressure, heart disease, and diabetes. High blood pressure can eventually lead to strokes; heart disease can lead to heart attacks; diabetes can result in damage to the body's organs such as the eyes, nerves and kidneys. Besides these complications, one can have difficulty moving around, exercising and breathing. Excessive weight is classified as obesity and morbid obesity. The latter, of course, is much worse. This classification can be determined objectively using the body mass index (BMI) which takes one's weight in kilograms and divides by the square of the height in meters. If English units are prefered one can take the weight in pounds and divide by the square of the height in inches and then multipy the result by 703. For example, if you are seventy inches and one-hundred and fifty pounds, your BMI is 21. If you weigh three hundred pounds your BMI is 43. A normal BMI is between 18 and 25; obesity has a BMI over thirty; morbid obesity has a BMI over 40. A graph of body mass index is shown above for those contemplating gastric bypass and gastric banding. What are the options? There are options (gastric bypass, Roux-en-Y surgery, gastric banding) for individuals with serious weight problems. However, weight reduction surgery such as gastric bypass or banding surgery is not an option for all obese individuals. For those truly considering gastric bypass and gastric banding there should be a general understanding of the normal digestive process. Then, we can understand abnormal digestion and explore options and discuss who are the candidates for a bariatric procedure. This will include a discussion about the gastric bypass and gastric banding surgery, anesthesia and potential complications. Finally, we will look at the long-term results of weight reduction surgery. The digestive system allows the body to take food and utilize it for nurishment for the body. Normally, this meets the body's immediate energy (caloric) requirements and allows for energy storage in the form of fat for times when food is not available. When humans evolved food was not easy to obtain so the body needed to adapt so it could store energy during times of fasting. The process starts in the mouth where salivary amylase breaks down foodstuffs. The process continues with the stomach, which in itself acts as a storage depot. The stomach's acids continue to break down chewed food materials. The food is released in small quantities into the duodenum where enzymes break down the material into substances that are easily absorbed throughout the twenty foot length of the small intestines. This includes proteins, carbohydrates, fats, fiber, vitamins and minerals. Towards the end of the intestinal tract in the large intestines, water is absorbed and waste material is concentrated for expulsion. Gastric bypass and gastric banding (bariatric surgery, weight reduction surgery) accomplishes weight loss by reducing the body's ability to absorb calories. Caloric restriction is affected by reducing or restricting the size of the stomach, which give the individual a sensation of early satiety. This is known as gastric banding. It is also accomplished by bypassing some of the intestines which reduces the amount of calories the system is able to absorb into the body and convert to fat. This is commonly known as gastric bypass. The latter method can result in malabsorption of nutrients resulting in nutritional deficiencies and dehydration. Click here for more information on gastric bypass. After a comprehensive medical examination, evaluation of health and psychological profile your doctor may recommend a surgical solution for obesity if diet and exercise have been unsuccessful. If one is under 350 pounds and has not had other abdominal surgeries then the surgeons prefer a laproscopic approach. This enables them to perform the surgery through several holes in the abdomen, rather than cutting skin and muscle open with a knife. The recovery time for the former method is significantly shorter with less post-operative pain and complications. Laproscopic surgeries such as gastric banding (lap-banding) and gastric bypass utilize pressurized carbon dioxide to tent the abdomen open to provide access for surgical instruments. The surgeon monitors the progress on video screens. This approach reduces scarring and allows for a faster recovery. Restrictive operations for obesity include laproscopic gastric banding of the stomach. A hollow tube or band of an inert material is placed around the stomach. A small port is placed under the skin that allows the physician to fill the tube with salt water. When the tube fills it tightens around the stomach creating a smaller depot for food (see figure below). This is one of the easiest procedures to perform and is safer than a malabsorptive procedure. The surgery and hospital stay is shorter and there are fewer nutritional deficiencies. However, weight loss is less. Although patients lose about 50% of their weight during the first year, less than 20% keep it off after 10 years. The problem resides in the fact that unless one modifies their eating habits they are able to work around the surgical solution by eating softer foods or just continue to eat in excess despite feeling full. Ultimately, success depends on diet modification and exercize and not the gastric bypass procedure alone. 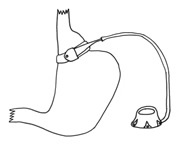 For more information on gastric banding click here. Gastric bypass and gastric banding have side effects and risks. Click here for information about potential side effects and complications of the surgery. Patients require general anesthesia for any type of bariatric / gastric bypass surgery. The anesthesiologist will go over one's entire medical history in order to ensure a safe procedure. In addition to rendering unconsciousness, the doctor will provide antiemetics and pain medications for the initial recovery. The patient usually stays in the hospital for a few days. One's discharge from the hospital depends on the ability to move without much discomfort, drinking liquids or easting soft foods without vomiting, and no longer requiring injectable pain medications. One will stay on liquid foods for several weeks. During a follow-up visit, the surgeon will determine if there are any mineral or vitamin deficiencies. Once one begins to eat solid foods, the patient will need to train to eat smaller meals throughout the day rather than large meals. Finally, one needs to initiate an exersize program to help maintain a balanced life and maintain motivation. Bariatric / gastric bypass surgery costs about $25k-$35k. Some insurance plans will cover this surgery. If you are truly interested in this options you should contact your insurance carrier . Click here for frequently asked questions. Please see disclaimer.